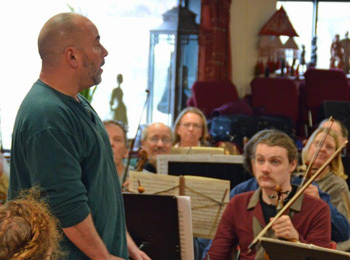 GMMF President Dan Weiss addresses the orchestra during a rehearsal. The Green Mountain Mahler Festival was founded in 2002 by Daniel Weiss, an avocational bassist, and physician and scientist at the University of Vermont and Fletcher Allen Health Care. The GMMF is modeled after the Northwest Mahler Festival, which was founded by Dr. Weiss in 1995 and has become a fixture of the Seattle music scene. The GMMF's mission is to provide the opportunity for local area musicians, including serious avocational musicians, professionals, and talented students, to experience the large-scale Romantic works not generally accessible to smaller local orchestras, and to bring this music to the public. Since 2002, we have held readings a few times per year. Readings are open to all qualified musicians, and draw as many as a hundred participants from throughout Vermont and the region. While family and friends are welcome to come and listen, the readings are not performances. Rather, each session is spent exploring a given piece of music for the musical growth and enjoyment of the participants. Readings to date have included the symphonies of Gustav Mahler as well as major works by Richard Strauss and Anton Bruckner. In addition to allowing local area musicians to experience these works, the reading sessions provide a unique opportunity for area conductors. 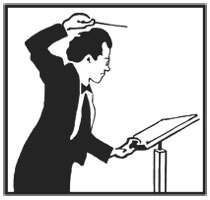 Participating conductors to date include Daniel Bruce, Andrew Massey, Michael Hopkins, and Troy Peters. The readings have also attracted visiting conductors from outside the local area, including Geoffrey Simon and Eric Hanson. Building on the success of the readings, the GMMF held its first public concert in June, 2009. For our inaugural concert, Andrew Massey led the GMMF Orchestra and Chorus and two area soloists in a performance of Mahler's Symphony No. 2, The Resurrection. This was followed by a performance of Mahler's Third Symphony in June, 2010, also under the baton of Mr. Massey. In January, 2010, the GMMF held a special benefit performance of the Brahms Ein deutsches Requiem under the direction of Nathaniel Lew, raising more than $10,000 for Haiti Earthquake Relief. Since then Daniel Bruce has conducted annual New Year's Day performances of Beethoven's Ninth Symphony (all but one of which have been benefits), and Mr. Massey returned in 2011 to conduct a benefit performance of Mahler's Symphony No. 2 along with his own work, Early Mourning. The Green Mountain Mahler Festival is free to all musicians and no fees are required for participation. We are a 501(c)(3) non-profit organization dependent on donations to help cover expenses, and hope that you will support GMMF in its continuing mission. Experience Mahler. It's happening in Vermont!